The cruise ships dock in the center of Warnemunde and is only 300 meters from the train station and city center. From there on one can travel to Rostock (20 min) and Berlin (a 2 and a half hour trip) Train schedules. The terminal can accommodate 3 cruise liners at a time. If all occupied, ships dock at the main commercial piers of Rostock at Seehafen on the other side of the river. Getting to Berlin under your own steam in one day isn't practical, since trains run on specific schedules that may conflict with your ship's time table. Shore excursions use charter trains or coaches, so that is the best way to reach the capital. Being a center of maritime traffic, the district of Warnemünde comprises numerous navigational aids, the oldest is the lighthouse, which is currently still in use. The lighthouse was built in 1897. In the summer, the tower, approximately 37 meters (121 ft) high, allows visitors to enjoy an impressive view over the Baltic Sea and the northern districts of Rostock. The nearby Teepott (Teapot) with its slightly curved roof, the resort’s second famous landmark, is an interesting example of East German (DDR) architecture. Built in the 1960s and renovated in 2002, it today houses different restaurants and a sea voyage exhibition. Warnemünde's acres of fine sand makes a sure fire hit as a holiday resort and this is where the ship docks. So if your ambition is no more than a touch of sunbathing and a stroll around the resort then all that is very close by. Yachts at anchor, a jumble of fishing boats, sea, cafes and bars, not forgetting the famous teapot, and a pier all lend character to this small but charming resort. Trains to Rostock leave about every 10 minutes for Rostock Hauptbahnhof. The train trip is less than 20 minutes, tickets are 1.80 Euro one way, which includes the tram in Rostock. Once you arrive at Rostock Main station, go two levels down and take either tram 5 or 6 to Neuer Markt and you are in the center of this charming town. The ticket machines at the train station and in the tram (for your return trip) accepts Euro coins and small bills and are automatically time stamped and your tickets are automatically validated. You can also buy a day ticket 4.60 Euro, which allows you to travel on all modes of travel, even ferries, in the municipal area of Rostock. There are HOHO buses in Warnemunde to Rostock but both cities are so compact it is not necessary. Also the intervals are 2 to 3 hours apart. Everything is within easy walking distance once you are in the center. Rostock town center is relatively compact so it is fairly easy to take in a number of sites within the course of a day. The place to start is St Peter's Church (St Petrikirche) in the oldest part of the city in the east. It started life as a wooden church in the 13th century but was followed by a brick Gothic construction with an 117m (380ft) tower which served as a landmark for sailors for centuries. Air raids destroyed the tower and part of the church in 1942. After a long wait of 52 years, the tower was rebuilt to a height of 125m (410ft) this time with a modern lift so visitors can ascend to a viewing floor. You can also take a train from Warnemunde to Lubeck, with a a change in Rostock. Lubeck is a delightful old city to visit. Trains run quite frequently. Visit Schwerin, about an hour away. You can purchase a Mecklernburg-Vorpommern Ticket 1st person €20 + €3 for each additional person up to maximum 5 people. It is valid from 9 a.m. on weekdays and the whole day on weekends for regional trains (RE or RB) and suburban trains (S). In Warnemunde in the vicinity of the canal called der Alte Strom (Old Channel), with its various restaurants, pubs and traditional fishing boats is rather touristy but fun to spend a few hours. 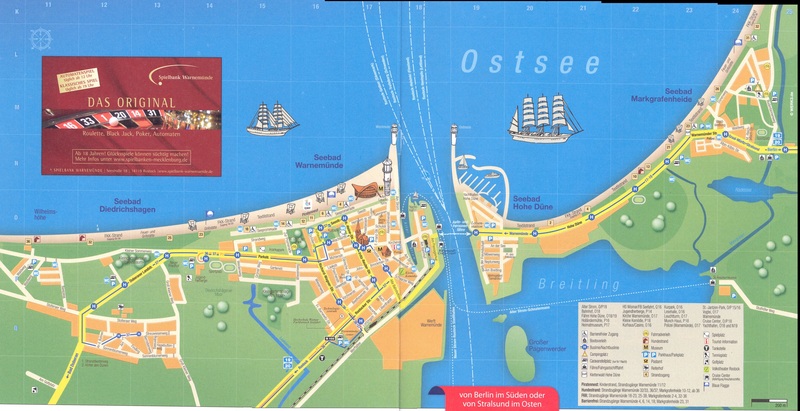 Rostock has a wider selection of stores and restaurants and has an more metropolitan atmosphere. Wifi is sparce in both Warnemunde an Rostock, and often has to be paid for. There is no WiFi in the direct port area.